Did you love the first two seasons of Osomatsu-san and desperately need something to fill the sextuplet shaped hole in your life? Do you know anything about horse racing? Do you have half an hour to kill? If so then you might as well check this out. This was a mediocre episode of Osomatsu-san. Most jokes didn't stick, and the ones that did were chuckle worthy at best. I'd say that there's a lot more gross-out humor in here than in the actual series, and most of it was pretty lazy. Art is noticeably stiffer than in the original series as well. There's only so many racing jokes that you can make, and at the end of the episode the writers seemed to be beating a dead horse (bad pun definitely intended). I don't know if I'd watch this were I to go back in time knowing how iffy it was. Unless you're a completionist, REALLY love Osomatsu-san, or happen to belong to a very niche group of horse-racing-anime fans, I'd say this is probably a skip. I didn't hate it, but I didn't really love it either. I respect your opinion if you think this special isn't that good like the previous reviewer, but I personally think this special was very much worth watching. Now if you don't like horses or horse racing and horse racing bets, then this special is probably not for you. 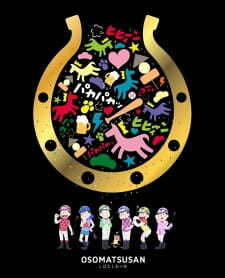 The whole episode centers on the Matsu brothers and supporting characters as they go through various experiences that are horse-related and horse-racing-related. The only true bizarre scene is the last one, so make sure to note that it's not realistic. Tbh, it took me a while for me to realize that when the characters mention the horse races, they mean they go to bet on the winning horse(s) rather than actually participating in the horse races. Thanks to this episode, I got the general gist of what Japanese people do during horse races (but only the realistic stuff. I am NOT a weeaboo who believes in everything anime shows me!). The comedy is still just as good as the show's to me. In fact, slightly better. Disagree with me all you want, I just like this humor (other than the OsoHorse, Finale Race, and Hatabou moment, though I still adore the Hatabou moment). Definitely recommend this to Osomatsu-san fans that don't mind being presented with a bunch of horse-related and horse-racing-related information with Osomatsu-san mixed in it.